Have you been looking for the best dog food for huskies? Check out our review to know what you should and should not feed him. Whether you keep a Siberian or Alaskan Husky, you are probably well versed with their friendly demeanor and mischievous behavior. Huskies are mostly known for their escapist tendencies. Nonetheless, they are a unique dog breed and, subsequently, have specific dietary needs. The Siberian Husky is particularly famous and for several reasons. However, the most notable features that set this creature apart are his handsome face, vibrant eyes, and fluffy coat. The Alaskan Husky, on the other hand, is bred primarily for its working capability rather than its charming looks. This breed can pull loads of bulky items for long distances. Both species are aptitude to endure cold and snow. With regards to nutrition, huskies require holistic, human-grade and organic certified dog huskies require holistic, human-grade and organic certified high-quality dog food. 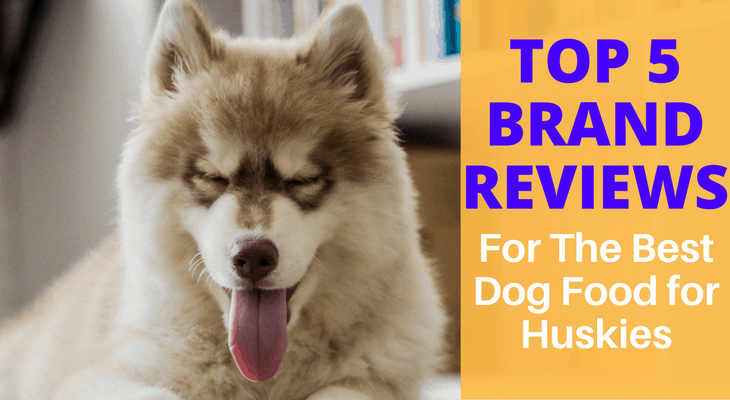 After going through the tons of options available on the market, we concluded that these five quality dog food brands for huskies. The following are comprehensive descriptions of the top high-quality dog food brands for these medium-sized dogs. Often, dog owners are at a loss on the kinds of food to feed their husky puppies. You will want to give your puppy the healthiest food you can find—and rightly so. Your husky will be relying on you exclusively when it comes to his food choices. So, just what is the best food for husky puppies? 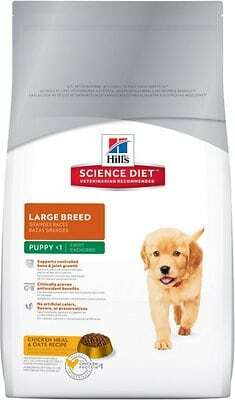 The Hill’s Science Puppy Food is an excellent choice! Our rating for this product is 4.8 out of 5 stars. The primary reason why we choose Hill’s Science Dog Food as the top choice for puppies is the small kibble size. Initially, when you start weaning your husky, he may find it challenging to chew and swallow big pieces. Fortunately, Hill’s Science understands this, and makes this product in tiny kibble sizes. If you love your husky, then you are bound to worry when he falls prey to digestive problems. Although it’s often difficult to pinpoint the precise cause of your husky’s digestive issue, keen owners cite specific dog foods as the cause. If you have identified this, then you should switch to a husky-friendly alternative such as the Hill’s Science Puppy Large Formula. Over time, some huskies begin to tire of this formula. You can avoid such a situation by mixing up his diet with other ideal food products. There is no question about the passion and commitment that Nutro Max devotes to making top quality pet foods. The company clearly cares about animals, giving utmost attention to their diet. This Large Breed Dry Dog Food is an example of their prowess in this field. 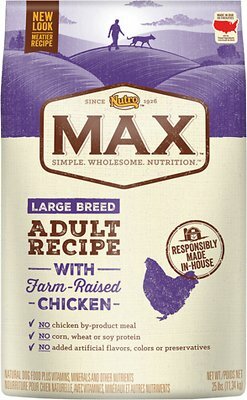 The Nutro Max Large Breed has a rating of 4.6 out of 5 stars. It may sound controversial, but dog food with minimal ingredients is better for your husky. Consider this: the fewer the number of ingredients, the fewer the digestive issues that your husky is likely to suffer. The key source of protein in the Nutro Max Dry Dog Food is real chicken, obtained from real poultry. Such a rich source of protein not only helps with muscle development but also strengthening. Like humans, dogs love the taste of chicken. This makes the Nutro Max Adult an inspired option for your pooch during meal times. All the ingredients in this product are 100% natural. It means that your husky will be feeding on one of the tastiest and healthiest pet products. There have been a few recalls about the Nutro Max Large Breed Adult Dog Food in the past. Keep an eye out for potential side effects. The Purina Pro Plan is the most recommended dog food for Siberian husky, and particularly for adult huskies. This dog food offers complete nutrition for your mutt. We gave the Purina Pro Plan a rating of 4.5 out of 5 stars. What I love most about this dog food is that all its ingredients are natural. It makes it an excellent food choice if you looking to promote the health of your husky’s joints, vision, and brain development. The first ingredient in the Purina Pro Plan is salmon. Salmon is a key source of protein that aids in supporting muscle mass. Other handy ingredients included in this dog food are rice and oatmeal. These are easy to digest; hence, suitable for huskies that suffer food allergies. Besides, it has also been supplemented with prebiotic fiber, which is highly digestible. It explains why most pet nutritionists advocate the Purina Pro Focus for huskies suffering from stomach upsets and diarrhea. It helps to prevent vomiting and gagging. 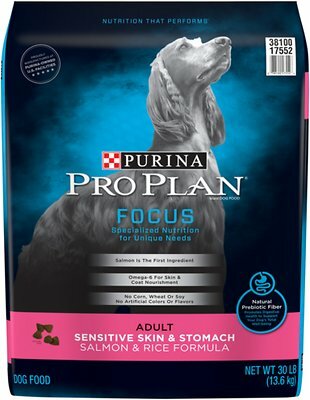 Some huskies have ended up having gastric problems after consuming this the Purina Pro Plan Focus. Wellness is known for making premium-grade dog foods—both the wet and dry type. The firm claims to rely on only quality ingredients while avoiding artificial flavors. 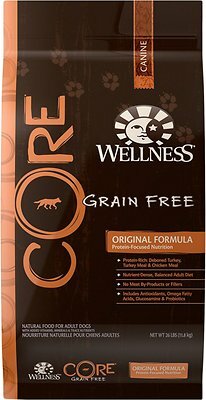 We gave the Wellness Core Grain Free brand a rating of 4.4 out of 5 stars. As you have noticed, all first three ingredients are key protein sources. Furthermore, turkey is easy for your husky to digest. It is one of the most preferred protein sources because of its content of fat and calories. Turkey meal, on the other hand, is highly dehydrated. In layman’s terms, this means its ingredients are highly concentrated. Has your Siberian Husky been showing appetite loss recently? Well, the Wellness Core Dry Dog Food is incredibly delicious. Once you feed him for the first time, you can rest assured that the husky will always look forward to his meals. Don’t get me wrong, I have nothing against potatoes but there’s no nutritional value in them worth recommending. It is a grain-free formula, which encompasses 25% crude protein and 15% healthy fats. 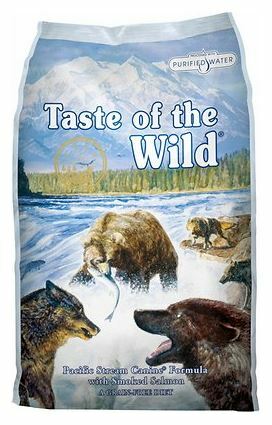 Like many of the pet products made by Taste of the Wild, this dog food is high-quality. Our rating for the Pacific Stream dry dog food stands at 4.5 out of 5 stars. If your husky loves fish, then he is likely to like this Taste of the Wild dog food. It is chock full of antioxidants, digestive enzymes, pre and probiotics. Thanks to the variety of nutrients, you’re rest assured that your husky will remain healthy and strong for the next couple of years. If you feel that your husky could do with a shinier coat, consider the Pacific Stream by Taste of the Wild. As previously stated, one of the core ingredients in this product is salmon. Aside from providing proteins, salmon is rich in omega fatty acids, which boost his coat and skin health. One concern that some husky owners have is that the amount of fat is a little bit on the higher side. The National Academies’ National Research Council (NRC) reports that the most significant nutrients for dogs are proteins, carbohydrates, and fat. All three elements are great energy sources for your husky. However, pet owners need to be cautious when shopping for dog foods. Huskies are susceptible to certain health problems. For instance, the Siberian Husky is lactose intolerant. As such, avoid feeding him milk and other dairy products. Many breeders also report that their huskies tend to digest food rather slowly. It is, therefore, not unusual to find him eating small amounts of food. However, you should monitor his meal schedules, ensuring that he does not go for more than a day without eating. Huskies are medium-sized dogs weighing 60 pounds (http://www.petmd.com/dog/breeds/c_dg_alaskan_husky) on average. To keep them looking healthy and active, you should purchase only dog foods tailored to meet their needs. Consider foods rich in proteins—these help to maintain his lean muscle mass. The Association of American Feed Control Officials (AAFCO) suggests giving him up to 18% of protein in their diet.